Once you exchange this voucher at the Duomo ticketing counter after skipping the ticket collection line, you will then be able to enjoy an all-access pass to all the spaces of the Duomo that are open to the public. This vision in Candoglia marble is Milan's most extravagant cathedral. On entering, you will see why. With its 3400 statues, 55 stained glass windows, beautiful altars, and paintings, the Duomo is the most important example of Gothic style in Northern Italy. After which you can make your way to the cathedral's elevator to head up the first terrace. 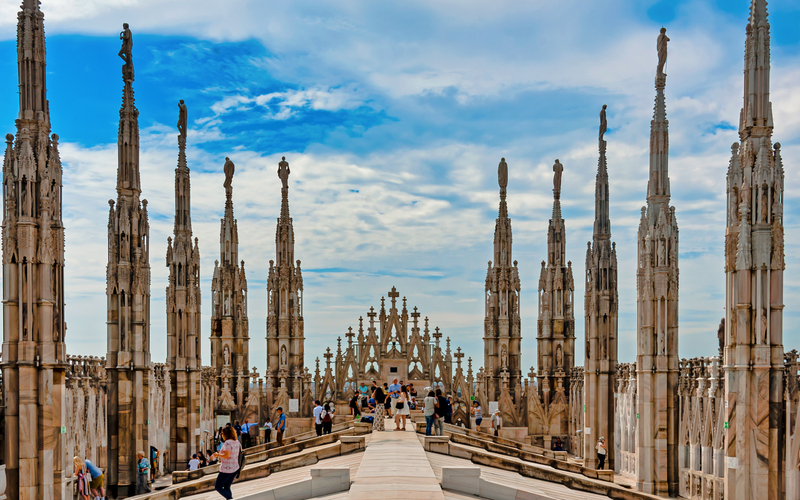 Walking through the spires and pinnacles that adorn its rooftop, you will see the breathtaking skyline of Milan. You can also visit the famous Archaeological Area underneath the Cathedral to discover the Baptistery of St. John and the Church of Santa Tecla. You will witness the perfect example of octagonal early Christian Baptistery and learn about the life in Milan during the Roman Age. You will have all the time you need to explore and wander until closing time. Skip the ticket collection line while exchanging your voucher and go to the entry line. With this pass to the Duomo, you can enjoy access to all the public spaces of the Duomo Cathedral; the Cathedral, the Duomo Museum, San Gottardo in Corte Church, the Archaeological Area and its rooftop with elevator access! Take your time to explore the length and breadth of the church with this flexible pass as it allows you admission anytime before the end of the year! The famed archaeological area underneath the Cathedral gives you the chance to discover the Baptistery of St. John and the Church of Santa Tecla. The Duomo is open daily from 8.00 AM to 7.00 PM. Daily 10.00 am - 6.00 pm. Closed Wednesdays. Last admission: 50 minutes before closing time. Visitors may be asked by the Cathedral's staff to begin leaving 30 minutes before closing time. Entry for children up to 3 years old, people with disabilities and helper, military personnel in uniform are free. In order to enter the Duomo, you must ensure your shoulders and knees are covered. Entry will be restricted for any low cut clothing. You will receive an email with your Skip The Line rack - Duomo Cathedral, Rooftop, and Museum voucher shortly. Please download and display your voucher on your mobile phone at the Duomo ticketing counter, in exchange for your physical pass to the Duomo. Duomo Ticket Counter, Duomo di Milano. These tickets are valid till the 31st of December, 2018. All access pass to the Duomo.